Pruning a dormant grapevine is the principal method for controlling the size of its crop. However, even when the same vine is pruned identically each year, its crop level will vary considerably from year to year. This variability occurs because the weather during both the previous and the current growing seasons greatly influences the number of shoots that develop per node, the number of clusters that develop on each shoot, the number of florets that develop on each cluster, the percentage of those florets that set to become grape berries and berry size development. Therefore, precise control of crop level isn't possible with dormant pruning alone. Because crop level has such a large influence on fruit quality, several crop adjustment strategies are often used in table grape production to achieve a target crop level. Thinning is the practice of adjusting crop level during the growing season. It is achieved in two fundamental ways: altering the number of clusters per vine and altering the size of clusters. How many clusters should be left to ripen on a vine? That simple, reasonable and important question has a complex answer. It depends on the variety being grown, the size of the vine, the use of cultural practices that alter the size of clusters, the desired crop level and year-to-year variations in vine fruitfulness. To begin sorting out these factors, let it first be stated that quality table grapes can be produced at times in temperate-climate vineyards with yields of 5 tons/acre or higher. However, mediocre fruit quality will often result when such high yields are combined with cooler-than-average growing seasons and/or less-than-optimum vine management. Therefore, commercial growers who apply good cultural practices to their vines should set initial target yields of 4 tons/acre and hobby growers should be content with initial target yields of 3 tons/acre to ensure satisfactory fruit quality (Table 3). Growers may find with experience that their vines are capable of yields larger than these initial targets as evidenced by the ease with which the crop ripens and the development of large vine size. In such situations, increasing the target yield will be warranted. Proceed cautiously, however — a large crop of poor quality is an all too familiar cause for destroying a table grape market. With a target yield in mind, the grower must then calculate the number of clusters to be grown on each vine. This will require knowing the number of vines per acre and the average weight of a cluster. The best source of information for average cluster weights is a grower's own several-year record of cluster weights for the specific variety and vine management for a specific vineyard. 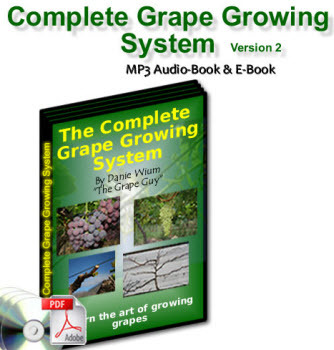 Naturally, such information is not available at the start of table grape production. Therefore, commercial table grape growers should develop a plan to gather such data. It can be done simply by counting the clusters as they are picked from the vine and placed into a picking lug. Then record the number of clusters on a 3 inch x 5 inch card and put the card in the picking lug. Weigh the lug at the packing shed and record the net fruit weight on the 3 inch x 5 inch card. These data can be permanently recorded after the hustle of harvest and used to calculate an average cluster weight. Doing this for 10 randomly selected vines of each variety each year will provide valuable information for crop adjustment in future years. Each year the multiyear average cluster weight information should be updated. For most individuals, the initial source of information for crop adjustment of table grapes will be published information. Table 3 lists several temperate-climate table grape varieties, their reported average cluster weights and the number of clusters required for 3-, 4- and 5-ton/acre target yields. Cluster weight information may not be available for a specific variety. Perhaps nursery catalog descriptions or other sources of information on the variety can be used to determine if its clusters are considered small, medium or large. Then use average cluster weights of 0.3, 0.5 or 0.8 pounds, respectively. Data at the bottom of Table 3 indicate the number of clusters required per vine for these three weights of clusters and for three target yields. Table 3. Average cluster weight and the number of clusters required per vine to produce yields of 3, 4 or 5 tons per acre for several temperate-climate table grape varieties. 1 Fruit grown under natural conditions unless indicated as follows: FCT = flower cluster thin; CT = cluster thin; BT = berry thin; GA = gibberellic acid application; G = girdling. 2 Data from the author's research at Benton Harbor, Mich. unless otherwise noted. 3 Assumes typical vine spacings with approximately 700 vines per acre. 4 Adapted from Table Grape Varieties for Cool Climates (Reisch et al., 1993). The data in Table 3 will not apply to some table grape vineyards. Calculations for any combination of vineyard dimensions and cluster sizes can be made according to the formula below. For example, the desired number of clusters per vine for a vineyard with 9-foot row spacing, 7-foot vine spacing, a target yield of 3 tons per acre and medium-sized clusters (0.5 lb.) would be 17 according to the example below. 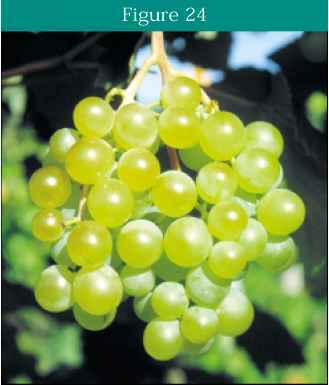 Lastly, when a grower is unable or unwilling to locate more accurate information for crop adjustment of temperate-climate table grapes, it will be useful to know that vines with typical vine spacings and medium-sized clusters will produce a moderate yield of 4 tons per acre with 24 clusters/vine. Therefore, begin in the first year of production by thinning to 24 clusters per vine. Then, after the first harvest, decide if that number needs to be increased or decreased in subsequent years. When the desired number of clusters per vine has been determined, situate half of them on each side of the vine space for good fruit distribution. If there are more shoots on a vine than the number of clusters needed, completely defruit some shoots. The leaf area on these fruitless shoots will promote the health of the vine. It may be appropriate to thin fruit to the desired number of clusters per vine either before or after bloom. It will depend on the variety being grown. The merits of these two basic choices in the time of thinning are presented below. Flower cluster thinning is performed before the start of bloom. It is most easily accomplished when the shoots average 8 to 12 inches long (Fig. 21) because clusters are highly visible at this stage of growth. The longer shoots grow, the more they will hide clusters. The basal cluster (the cluster closest to the base of the shoot) is typically left on the vine while one or more clusters farther out the shoot are pinched off. Flower cluster thinning will not only reduce crop level but also increase the set of berries for clusters retained on the vine. Therefore, flower cluster thinning is useful for loose-clustered varieties when increased berry set is desirable. However, flower cluster thinning is unsuitable for varieties with naturally compact clusters because it may cause excessive cluster compactness with subsequent berry cracking and fruit rot. Fig. 21 - Shoots 8 to 12 inches long indicate the optimum time to perform flower cluster thinning. Many table grape varieties have naturally compact clusters susceptible to berry cracking and fruit rot. In such situations, flower cluster thinning is hazardous. It is best to adjust crop size by thinning clusters after fruit set (Fig. 22). 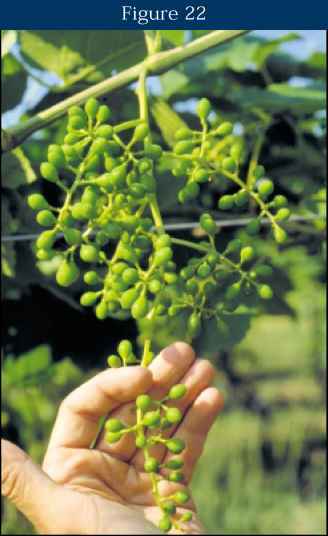 As a generalization, the greater the number of clusters on a vine during bloom, the fewer berries that will set on each cluster. Such reduced fruit set may help to reduce cluster compactness and fruit rot. 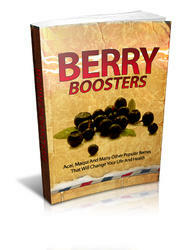 It may also allow the berries on the clusters room to enlarge without creating excessively compact clusters. Therefore, whenever cluster compactness is a concern, use cluster thinning rather than flower cluster thinning to adjust crop level, even though it is more difficult and more costly. Fig. 22 - A cluster at the end of fruit set. Berries are slightly smaller than pea-sized. This is the ideal stage of development for berry thinning, cane girdling and/or gibberellic acid sprays to size berries. vine. 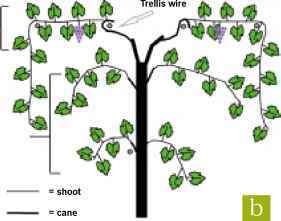 Locate these not in the primary fruiting zone but rather lower on the trellis (Fig. 23a). After fruit set, when all berry shatter has occurred, all clusters in this temporary fruiting zone are removed along with any additional clusters that need to be removed from the primary fruiting zone (Fig. 23b). Fig. 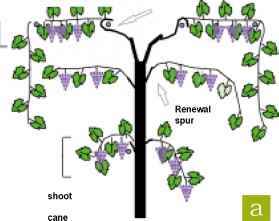 23 - A schematic of the cross-section of a vine using modified Munson training (a) before bloom and (b) after bloom when cluster thinning has been performed. Berry thinning is very useful to modify cluster shape when a variety has elongated, straggly clusters. Flower cluster thinning may increase the cluster compactness of long, straggly clusters to produce large, showy clusters. Though these are exciting to grow for the hobby grower, they can be difficult for the commercial grower to harvest and package. Berry thinning produces smaller, globular, more manageable clusters than flower cluster thinning by pinching off the lower portion of the cluster immediately after fruit set (Fig. 22). This increases both cluster compactness and berry size on the remaining portion of the cluster (Fig. 24). Because berry thinning creates smaller, lighter clusters than either flower cluster thinning or cluster thinning, more clusters can be retained on the vine to produce the same size crop (see data for the Marquis variety in Table 3). This practice should be used only on varieties with loose clusters. For example, this practice is not suitable for the tight-clustered variety Canadice, but it gives excellent results when applied to the loose-clustered variety Marquis. Fig. 24 - A compact, globular cluster of the 'Marquis' variety created by berry thinning, which removed half the length of the cluster rachis.